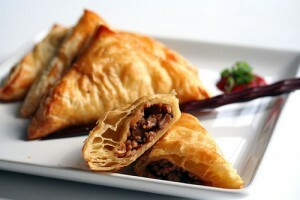 Chinese Samosas recipe by maham at DesiRecipes.com. Heat the oil on a high flame. Put the cabbage , onions, carrot , bean sprouts and Ajinomoto powder and cook for about 3 minutes. Put the noodles, soya sauce and salt . Combine all the ingredients and put water to make a stiff dough. Roll out into very thin circles. Grind the ginger and garlic into a paste. Combine the paste with the remaining ingredients. Put a little stuffing on each circle and fold over to form a semi-circle. Bring the ends together and press. Repeat the same procedure for the remaining circles. Deep fry in oil until it becomes crispy. Serve hot with spicy tomato sauce.